The National Commission for Culture and the Arts, Cultural Center of the Philippines and Teatro Sambisig Inc. present the very first national conference on Philippine Theater aesthetics – “TANGHALIN ANG TANGHALAN”. 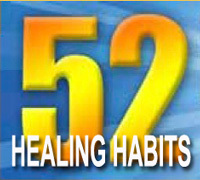 The conference is on September 28-29, 2011 at the Silangan Hall of the Cultural Center of the Philippines, Manila. Guest speakers include Dr. Bienvenido Lumbera, Dr. Nicanor Tiongson, Dr. Leoncio Deriada, Dr. Prospero Covar, Dr. Priscelina Legasto, Dr. Lulu Torres-Reyes, Dr. Orlando Magno, Mr. Nestor Horfilla, Mr. Lutgardo Labad, Prof. Jerry Respeto, Mr. Roberto Mendoza, Mr. Manny Pambid and other luminaries in cultural research. The conference aims to provide a venue for sharing and critical discussion among theatre artists and scholars. The conference highlights include a presentation of research results of the “Tanghalan: A Preliminary Survey and Research on Regional Theater Aesthetics” and a sharing-discussion among theatre scholars, artists and students. The conference hopes to develop critical lenses in appreciating the richness and diversity of theater work through the inputs of participating theater practitioners. Interested parties are requested to register through email at tanghalinangtanghalan@yahoo.com or text 0919-216-0440, 0917-328-2582 or 0933-252-5662. A conference fee of P800.00 will be charged to cover meals for two days and a conference CD kit. Observers are also welcome to listen to the discussion. For questions, please contact BJ Borja (Publicity/Promotions Officer) through bjborja@gmail.com. 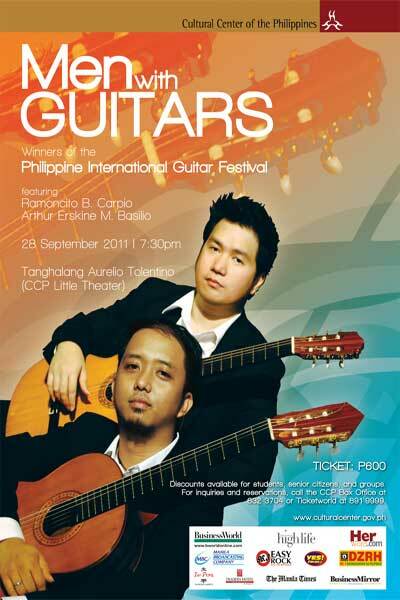 TOP prize winners of the 2011 Philippine International Guitar Competition, Fiipino guitarists Arthur Erskine M. Basilio and Ramoncito B. Carpio perform in a concert billed as Men With Guitars on September 28, 2011; 7:30 PM at the Cultural Center of the Philippines Tanghalang Aurelio Tolentino (CCP Little Theater). Program includes Mario Castelnuovo Tedesco's Capricco Diabolico, William Walton's Bagatelle No.3 (alla Cubana) and Bagatelle No. 1 (Allegro), Heitor Villa-Lobos's Etude No. 7, 3 Jazz Pieces (featuring Chick Corea's Spain, Pat Metheny's Letter from Home, Antonio Carlos Jobim's One Note Samba), Francis Kleynjans' Dawn of the final day (A L'aube du dernier jour), Francisco Tarrega's Fantasia on themes from “La Traviata", Johann Sebastian Bach's Allegro Assai from Violin Sonata No.3, Johann Kaspar Mertz's Variation Mignonnes, Maximo Pujol's Elegia por la Muerte de un Tanguero, Philip Houghton's Stele, and Manuel de Falla's La Vida Breve, among other pieces. Monching Carpio won the top prize in the 2011 Philippine International Guitar Competition, 3rd Prize in the 2011 Singapore International Guitar Competition, 3rd Prize in the 2010 Bangkok International Guitar Competition and 2nd Prize at the 2009 NAMCYA (National Music Competitions for Young Artists) Guitar Category C. He earned his Bachelor of Music degree, major in Guitar at the University of the Philippines College of Music, under the tutelage of Prof. Lester Demetillo. He has concertized around the Philippines and in Thailand, both as soloist and chamber musician. Monching is a member of the Philippine Guitar Ensemble (PGE). Besides writing music for the guitar, he also writes music for stage plays, short films and websites. He is currently taking his Master of Music degree at the Philippine Women’s University under Prof. Benchito Carino. Arthur Erskine M. Basilio received the “Best Filipino Guitarist” award at the 2011 Philippine International Guitar Festival and Competition. He also participated and won the UST Guitar competition in Year 2000, and competed in the 2006 NAMCYA Guitar Competition Category C which garnered him the 3rd place. Performance credits include “Concierto de Aranjuez” at the UST museum and a number of performances at the CCP with the UST Guitar Ensemble. Adventurous at heart, he explored different genres of music which led him to new places and experiences - jazz recording, rock and theater music, to name a few. He has fairly become a participant in the local music industry. Erskine is currently a guitar faculty member at the UST Conservatory of Music. For ticket inquiries, contact the CCP Box Office at 832-3704 or Ticketworld at 891-9999, or call the CCP Music Division at 832-1125 loc. 1604-1605. Speakers during the Forum are the Exec Coordinators for: Eastern & Southern Mindanao – Ms. Jhoanna Lyn Cruz; Western Mindanao - Fr. Albert Alejo, S.J., Ph. D.; National Capital Region – Dr. Ma. Luisa Torres Reyes, Ms. Ma. Carmen “Menchu” Sarmiento, Dr. Jose “Butch” Dalisay, Northern Luzon- Dr. Elizabeth Raquel, Southern Luzon - Mr. Carlos Arejola, and Eastern Visayas – Mr. Phil Harold Mercurio. Coordinators of this activity: CLA Head, Dr. Priscilla S. Macansantos and Vice Head, Dr. Christine Godinez-Ortega and NCCA Staff: Mylene, Ferdie and Alvin. Slots are limited. 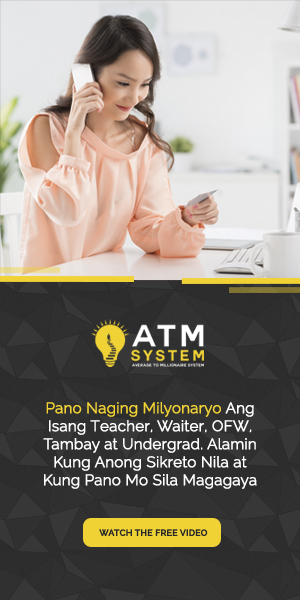 Please contact Amy Bojo of CMU, 09173997732, or call Leda or Ofelia in MSU-IIT’s OVCRE-MMIDU (063) 2232343. After the rousing success of Noli Me Tangere, the Musical, its 25th Season opener which ran for 22 performances, Tanghalang Pilipino continues its to celebrate 25 years of the best of Philippine Theater by honoring Filipino Artists as architects of the Filipino Identity. TP salutes its resident playwrights notably Tony Perez, Paul Dumol, Malou Jacob, and Rene Villanueva, all of whom belong to the league of contemporary scribes whose deep sense of love of country, of peace, of truth and justice, and of integrity and spirituality infuse their work with a particular Filipino perspective on the aspirations and challenges of modern-day life. For its second offering, TP pays tribute to one of its most prolific playwrights in Tatlong Tabing: Three Plays by Tony Perez, featuring three of Tony Perez’s most outstanding plays. Tony Perez, who has spent over two decades eloquently dissecting the Filipino psyche, is an important playwright in contemporary Philippine drama. 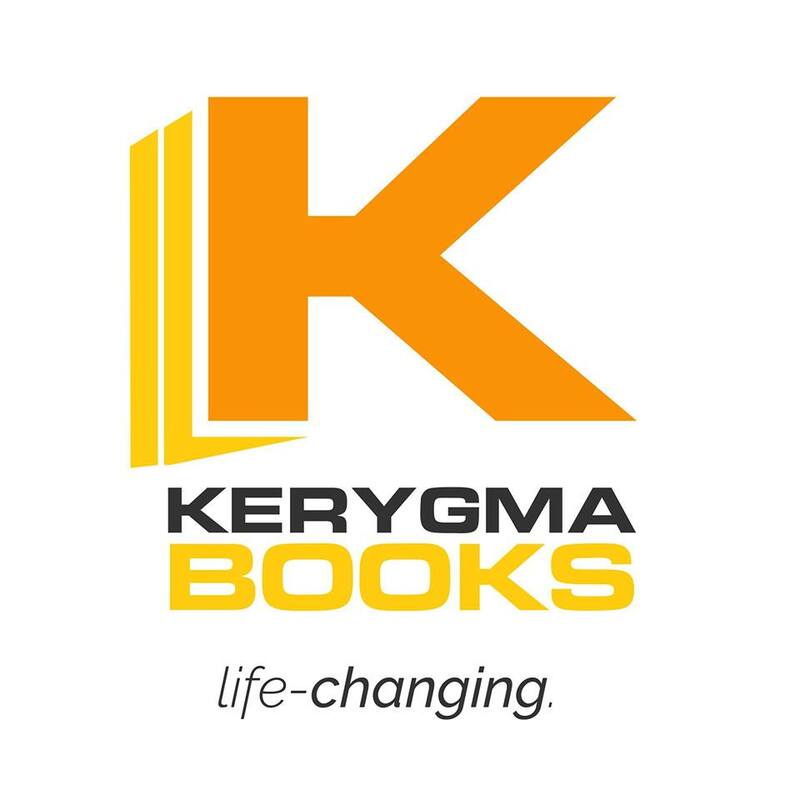 A prolific playwright with several volumes of published works, his plays deal with adult themes such as intense love, betrayal, separation, compassion, poverty, hunger, marriage, birth, and death. Dissecting the Filipino psyche, his plays deal with adult themes such as intense love, betrayal, separation, compassion, poverty, birth and death. The plays will be directed by a team of artists and educators who act, direct, write, and design. The plays featured in this trilogy trace the artistic development of Tony Perez as a playwright. Sierra Lakes is a tension-filled usap-usapan (dramatic conversation) that explores issues among four people caught in a complicated web of love and desire. It will be directed by Tess Jamias, an alumna of the TP actors company. Bombita is a black comedy which questions the blind obedience and subservience behaviour of young rookies in the military. Funny, but almost in a pathetic way, it reveals the emotional and intellectual short-comings of our men in uniform. 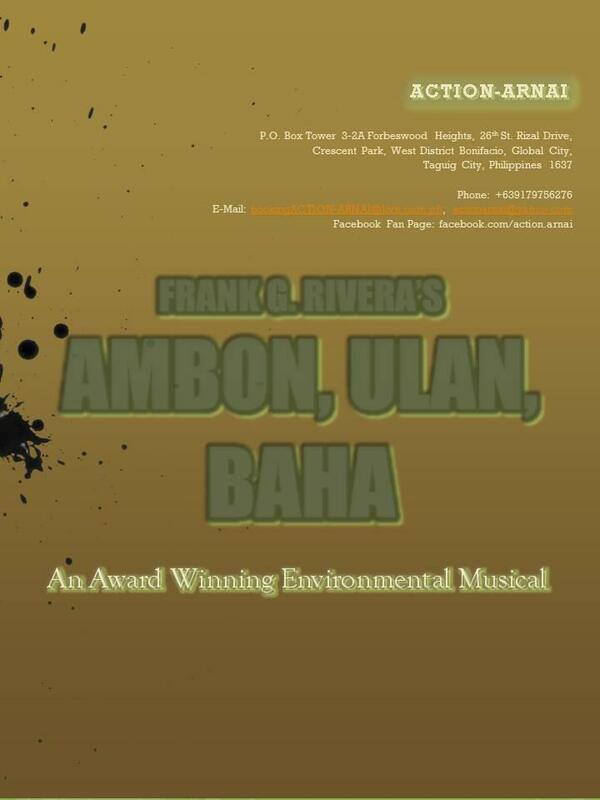 It will be directed by Dennis Marasigan, TP’s former Artistic Director. Nobyembre, Noong Akala Ko’y Mahal Kita, a case study of the absence of love in an average, middle-class male in contemporary Philippine society, is part of the multi-awarded playwright’s thought-provoking trilogy about love, friendship and companionship, and their consequences in our lives. It will be directed by Tuxqs Rutaquio, one of today’s most sought-after theater directors. Tatlong Tabing: Three Plays by Tony Perez showcases the talent and versatility of TP’s very own Actors Company, which includes Jelson Bay, Riki Benedicto, Martha Comia, Regina De Vera, Gino Ramirez, Rayna Reyes, Jonathan Tadioan and Marco Viaña. Joining the cast are TP alumni including Mayen Estañero, Marjorie Lorico, Russell Legaspi and Dan Jarden de Guzman. The production also features guest performances of Anthony Falcon, Bodie Cruz, a mainstream actor and Acey Aguilar, an alumnus of the Philippine High School for the Arts. Tatlong Tabing: Three Plays by Tony Perez will run from September 30 to October 23 2011 at the CCP Tanghalang Huseng Batute. As part of the celebration, an exhibit of Tony Perez’s paintings will be mounted during the entire run of the production. Interested sponsors, showbuyers, and block buyers may call us for more details at 8323661, 832 1125 local 1620/1621. Look for Lorelei Celestino or Paulo Perez. Tickets are also available at Ticketworld at 891999 and at the CCP Box Office. 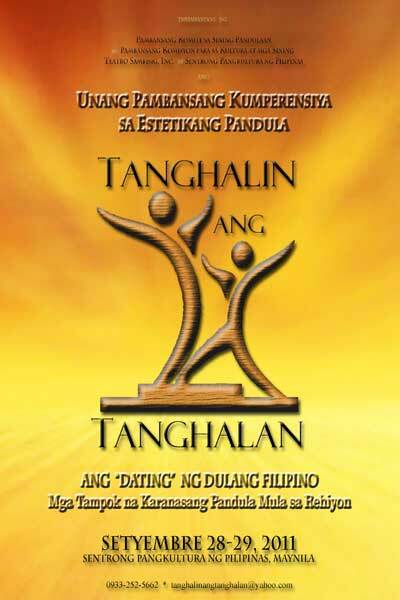 Visit the official TP website at http://tanghalangpilipino.org.ph/main/ for other information. THE rich musical and cultural heritage of Pampanga will be celebrated in a musical production billed Mikit Tamu King Milabas (Romancing the Past) on September 24, 2011, 4pm at the Cultural Center of the Philippines Tanghalang Aurelio V. Tolentino (LittleTheater). The show, a co-production of the CCP and ArtiSta.Rita, presents the collection of ArtiSta.Rita zarzuelas and showcases excerpts from the group’s most unforgettable and outstanding musicals staged in the last ten years. The show also marks the group’s 10th anniversary. Founded in Sta. Rita, Pampanga in 2001, ArtiSta.Rita is a non-stock, non-profit organization composed of artists dedicated to promote the arts, and in particular to keeping Kapampangan music alive. Inspired by the popular songs of childhood, ArtiSta.Rita took on the challenging and ambitious project of recording old, almost-forgotten Kapampangan songs. Whether in their traditional form or modernized, the albums received an enthusiastic response and created a strong and loyal following for ArtiSta.Rita’s brand of music and artistry. To date, ArtiSta.Rita has produced four all-Kapampangan music recordings, with one more in the works. Among its other accomplishments is the creation of the Duman Festival in 2002. This yearly Festival, with fine Kapampangan music and cuisine as main attractions, has grown to become a grand cultural event, drawing crowds to Santa Rita, Pampanga. For its work in promoting Kapampangan culture, ArtiSta.Rita was given the 2004 Most Outstanding Kapampangan award and the 2007 National Commission for Culture and Arts Gawad Alab ng Haraya Award (Duman Festival). For its CCP show, ArtiSta.Rita will present excerpts from three zarzuelas in its collection---Kapampangan Ku, Kwayan and Pamanuli. 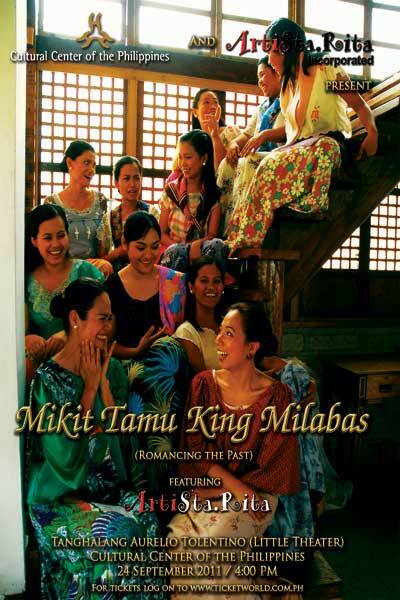 Kapampangan Ku portrays provincial life in the olden times. Kwayan highlights the Kapampangan’s bayanihan spirit while Pamanuli shows how old traditions evolve and change in modern times. Tickets are priced at P1,500 with 50% discount for students, 20% discount for senior citizens, government employees and military personnel. Group discounts are available. For more information, please call the CCP Performing Arts Department at 8321125 loc. 1606/1607 or CCP Box Office 832-3704.
a volunteer group working to provide venues and events for alternative education. a ten-year series of alternative education projects. via music, the arts, poetry, sports, photography, fashion, graphic design, literature, new approaches to science, film, cultural studies, theatre, dance, and any other way except being in a classroom--the convenors of Rock Ed decided to Rock Society through Education and educate the youth through rock culture. a group of private citizens that value education in its traditional form but creates alternative solutions for teacher training and student activities to enhance classroom learning--NOT replace it. For those who have graduated, talk to your Alma Mater's President or Principal and make them aware of Rock Ed's availability to provide these substitute classes! Get us in touch with your org head or your student affairs dean or student council president so we can plan events leading up to the 3 key dates for the global anti-poverty campaign.Plan your own white band event! Coordinate with Rock Ed for content or materials. 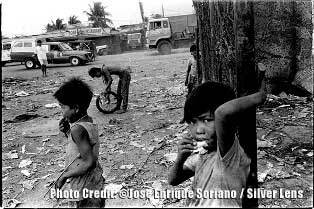 Organize a poverty awareness photo exhibit, coordinate so we can send you Jose Enrique Soriano's photo exhibit called "EPISODES" Still photos of the unstill mind. Feature MDGs on your articles, invite anyone from our roster to contribute an article, feature our events, interview our volunteers. Give anti-poverty awareness articles and features free media mileage! Space in your publication. Seconds on-air. Lend your voice to the campaign. Get us in touch with your marketing arm so your comany can sponsor awareness banners for public schools and white bands to give out for free. We want everyone to join in the voice ---let's not make them spend anymore. You can sponsor several "Rock Ed Series" visits to public schools. Donate P1000 for a banner, we can put a small logo of yours on the side. Banners will be hung in school campuses. Or print it yourself! We'll provide the design. Donate white bands!! Give it away. You can donate paper to our office. Wawa. MORE BANNERS TO SEND TO SCHOOLS IN ALL THE REGIONS!!! We want a "NO MORE EXCUSES, PHILIPPINES!" banner in every single campus in this archipelago. Volunteeeeeeeer! we'll find something for you. Invite Rock Ed to your schools! Coordinate with us. Allow a singer, artist, poet, anybody on our list to be your substitute social studies teachers for one day a quarter. If you want to help volunteers set up BookBigayan, RockRegalo and RockBakuna Projects, we accepT donations thru BPI bank account ROCK ED PROJECT account #3080-0073-44 LOYOLA-KATIPNAN. In observance of History Week from September 15-21, 2011 with the theme “Pag-alala sa Nakaraan, Pagsulong sa Kinabukasan” and the continuing celebration of the 150th birth anniversary of Jose Rizal, the National Historical Commission of the Philippines is spearheading two big events – the ROCK RIZAL and RUN RIZAL. 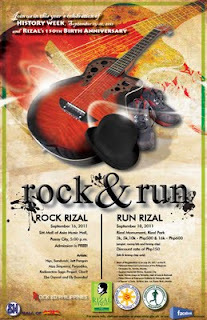 In collaboration with RockEd Philippines, Rock Rizal will be held on September 16, 2011 at the Music Hall, SM Mall of Asia. True-blooded rockers are invited to jam with the music of Ely Buendia, Sandwich, Ebe Dancel, Radio Active Sago Project, Jett Pangan, and a lot more. Prior to the concert, they worked together to produce an album that will feature songs covering the life and works of Jose Rizal. The album can be downloaded for free at RockEd’s Facebook account. 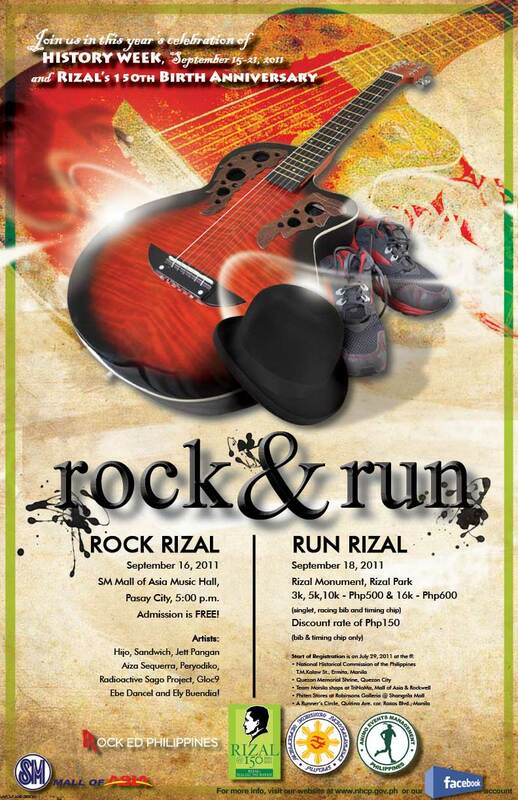 The Run Rizal will be held on September 18, 2011, a tie-up with the Animo Events Management. The run will start and end at the Rizal Monument and will wind through Roxas Blvd. and Diosdado Macapagal Avenue. Runners can participate in the 3K, 5K, 10K, and 16K. This run for-a-cause activity is for the benefit of the three Rizal Shrines administered by the NHCP, namely; Rizal Shrine Calamba, Rizal Shrine Dapitan, and Rizal Shrine Fort Santiago. Registration fee is Ph 600 for 16K and Ph 500 for 3K, 5K, 10K (inclusive of singlet, timing chip and bib). Promo for students, government employees and novice runners in 3K is Ph 150, inclusive of timing chip and bib only. 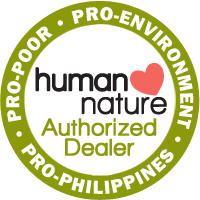 Registration is ongoing at the following sites: NHCP main office in Kalaw St. Ermita, Manila; Quezon Memorial Shrine (QMS), Quezon City Circle; Team Manila Stores in Trinoma, SM Mall of Asia; Rockwell and Phiten Stores at Robinsons Galleria and Shangrila Mall, and ARC Runners Circle. Fore more information look for Mona Lisa Quizon at telephone nos. (02)523-9050 and (02)523-1037. 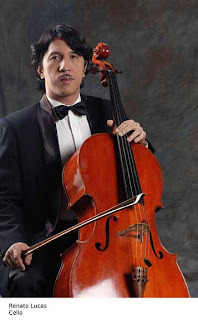 Noted Filipino cellist Renato Lucas opens the Philippine Philharmonic Orchestra's (PPO) 29th Concert Season 2011-2012 with a “A Hero’s Life” on September 9, 2011, 8:00 p.m. at the Cultural Center of the Philippines’ Tanghalang Nicanor Abelardo (Main Theater). Under the baton of Maestro Olivier Ochanine, Lucas will perform Elgar’s Cello Concerto. The concert will also feature the Saint-Saens’ Bacchanale from Samson and Delilah, and Strauss’ Ein Heldenleben. Lucas studied at the University of the Philippines, the San Francisco Conservatory of Music (USA), Royal Northern College of Music (England), Hochschule fuer Musik Detmold (Germany) and Universitaet der Kunst Berlin (Germany). He has been the principal cellist of the PPO for three decades and appeared as soloist and conductor in various occasions as well as appearances with many ensembles like the Manila Symphony Orchestra, Manila Chamber Orchestra, Camerata Manila, the Metro Manila Symphony Orchestra and the UST Symphony Orchestra. He also performed in various music festivals, cello recitals, chamber music performances like the CCP’s Filipino Artist Series, Coke Bolipata’s Pundaquit Arts Festival, and the Las Pinas Bamboo Organ Festival to name a few. Lucas has worked with practically the whole spectrum of music collaborating pop icons Ryan Cayabyab, Basil Valdez; contemporary composers from the Asia-Pacific Region,; collaborations with contemporary dancers like Myra Beltran; film scoring collaborations with Nonong Buencamino/ Marilou Diaz-Abaya and recently, accompanied renowned Filipina pianist Cecile Licad’s training of the Pundaquit Chamber Orchestra. Recent concerts include the monumental Dvorak Cello Concerto with the State Philharmonic Brno (Czech) which featured Lucas in their Asian tour. Discography includes recordings with the Philippine Philharmonic Orchestra’s Homecoming I Concert of Bruch’s Kol Nidre which drew rave reviews and was released on CD. Recent CD recording entitled ROMANZA (Tawid/Ivory with Raul Sunico) which received the 2006 Awit Awards for Best Instrumental Recording. Lucas currently holds an Associate Professorship at the University of Santo Tomas. He holds an M. A. History from the UST Graduate School with his thesis on the History of the Symphony Orchestra in the Philippines (also reading his Ph.D. in Cultural History) and is a Research Fellow for the University’s Center for Intercultural Studies. The Philippine Philharmonic Orchestra (PPO) is the country’s leading orchestra and is widely regarded as one of the top musical ensembles in the Asia-Pacific region. In August 2011, the PPO performed at the National Centre for the Performing Arts (popularly known as the “Egg”) in Beijing, China to mark the 35th year anniversary celebration of the Philippines-China Diplomatic Relations. The concert was supported by the Rustia Tantoco Foundation spearheaded by Zenaida “Nedy” Tantoco. The National Commission for Culture and the Arts’ (NCCA) annual celebration of National Indigenous Peoples’ Month moves to Davao Region in Mindanao with Tagum City as its main venue. This October, Dayaw: Indigenous Peoples Festival 2011, under the auspices of the NCCA’s Subcommission on Cultural Communities and Traditional Arts and Mindanawon Foundation, in partnership with local governments, government agencies and the private sector, focuses the spotlight on the country’s indigenous peoples, celebrating their arts and ways of life, discussing important issues and making more people aware of the richness and importance of indigenous cultures. The leaders and representatives of more than 100 indigenous peoples of the Philippines will converge together on October 6-10, 2011 to showcase their rituals, performing arts, cuisines, games, crafts and others. Additionally, they will be joined by delegates from Southeast Asian countries in simultaneous exchange and interactive activities such as performances, exhibitions, forums, lecture-demonstrations, workshops on traditional crafts and cuisines and indigenous games. 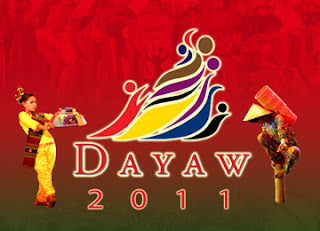 This year, Dayaw aims to celebrate the cultures of the Filipino people as well as those of the visiting foreign delegates by “understanding the commonalities of the various indigenous peoples.” It also aims to “strengthen/broaden the awareness, appreciation and pride of all Filipinos for our own traditional culture in the context of cross-cultural interactions in a global society. With the theme “Paghabi ng Ating Pagkakatulad Tungo sa Kapayapaan” (Interweaving Our Commonalities Towards Peace), the festival features many components such as Tanghalang Makulay (a ritual and performing arts festival), Salu-salong Sarap (a food festival), Mga Habi ng Panaginip (an arts and crafts exhibit, focusing on basketry, textile and mat weaving), Sama-sama sa Tuwa (games/sports), and Usapang Dangal at Likhang Paghayag (forum and creative workshop on peace and unity). The celebration is in consonance with Presidential Proclamation 1906, declaring October as National Indigenous Peoples’ Month. The NCCA has been holding major festivals for several years now in Luzon, Visayas and Mindanao. In 2007, Kalimudan: Panaghi-usa sa Mindanao (Mindanao Indigenous Peoples’ Gathering) held in Davao City in November, featured Mindanao’s ethnic groups. The following year, Timpuyog: Indigenous Peoples’ Month Celebration in Luzon was held in Santiago City, Isabela, focusing on Luzon ethnic groups and featuring performances, arts and crafts workshops, cultural awareness lectures, forums, tours, and a theme-park exhibition featuring the traditional houses, cultural resources, practices/rituals, chants, music, songs and dances, stories, traditional arts and crafts, indigenous games. In 2009, the Indigenous Peoples’ Festival was held in the Visayas, particularly in Roxas City, Capiz, called Dungog, with similar activities and aims. Last year, Dayaw 2010 was held in Metro Manila. Dayaw 2011 is held in cooperation with local governments, National Commission on Indigenous Peoples, Department of Education, Department of Tourism, Department of Interior and Local Government, Department of Foreign Affairs, Commission on Higher Education, Philippine Information Agency, Department of Trade and Industry, National Commission for Muslim Filipino, SM City Davao, Abreeza Ayala, as well as non-governmental, socio-civic and peoples’ organizations. The NCCA is led by its chairman, Prof. Felipe de Leon, Jr., and Malou Jacob as executive director, with Commissioner Joycie Dorado-Alegre as SCCTA head. 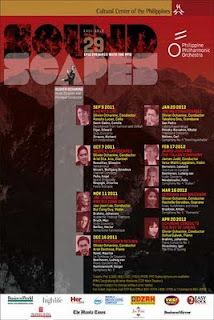 The Cultural Center of the Philippines (CCP) proudly announces the Philippine Philharmonic Orchestra's (PPO) 29th Concert Season 2011-2012 under the baton of its Music Director, Olivier Ochanine. In a master classics season entitled Epic Evenings, Maestro Ochanine and the PPO open the season with “A Hero’s Life” on September 9. Noted Filipino cellist Renato Lucas performs Elgar’s Cello Concerto. The concert will also feature the Saint-Saens’ Bacchanale from Samson and Delilah, and Strauss’ Ein Heldenleben. Clarinetist Ariel Sta. Ana performs with the PPO on October 7 with Musical Landscapes of Revueltas’ Sensemayá, Mozart Clarinet Concerto, Respighi’s Feste Romane and Peña’s Igorot Rhapsody. On November 11, renowned Korean conductor Jae Joon Lee returns to the CCP stage with one of Vietnam’s top violinists Bui Cong Duy to perform Max Bruch’s Violin Concerto and Berlioz’s Symphonie Fantastique. The PPO will also perform Brahms’ Academic Festival Overture. Maestro Olivier Ochanine once again wields the baton in a Christmas concert with the return of eminent Filipino pianist Ariel Dechosa on December 16, featuring Ravel’s Le Tombeau de Couperin, Beethoven’s Piano Concerto No. 4, and Rachmaninoff’s Symphony No. 2. Japan’s prominent trombonist Takahiro Ono ushers in the New Year with Rimsky-Korsakov’s Trombone Concerto on January 20, 2012. The PPO will also perform Dvŏrák’s Czech Suite, and one of the signature works of Denmark’s most celebrated composer, Carl Nielsen’s Symphony No. 4 “Inextinguishable”. Distinguished British born conductor James Judd conducts the PPO on February 17 in Mendelssohn’s Symphony No. 4 “Italian” and Bernstein’s Overture to Candide. Finnish violinist and concertmaster of the New Zealand Symphony Orchestra Vesa-Matti Leppänen, performs Beethoven’s Violin Concerto. The concert will be presented at the Philamlife Theater at 7:30 p.m.
Anton Bruckner Symphony No.4 “Romantic” will highlight the March 16 PPO concert under the baton of Maestro Olivier Ochanine. The concert also features one of the country’s top sopranos, Rachelle Gerodias in arias, kundimans and more. On April 20, Leeds International Piano Competition winner renowned Russian pianist Sofya Gulyak ends the PPO season with Igor Stravinsky’s “The Rite of Spring” and Brahms’ Piano Concerto No. 1. All concerts (except Feb. 17 concert) will be staged at the Cultural Center of the Philippines' Tanghalang Nicanor Abelardo (CCP Main Theater) at 8:00 pm. Billed as Morning of Loving Memories: A Tribute to Edith Lopez Tiempo, the program for the event also includes readings of poems and reminiscences by friends of the late National Artist, as well as music and dance performances. Together with her late husband Edilberto K. Tiempo, she founded and directed the Silliman National Writers Workshop in Dumaguete City, which until now, has trained and produced some of the country’s best creative writers in English. 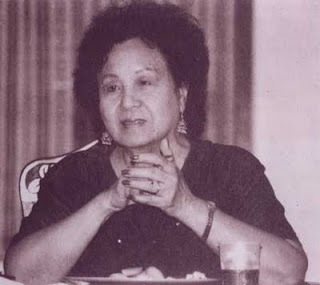 She was a recipient of several awards from the Don Carlos Palanca Memorial Awards for Literature and the Philippines Free Press literary contests and the Elizabeth Luce Moore Distinguished Asia Professor Award (1978) and has received grants and fellowships from Rockefeller Foundation, the Ford Foundation and the Asia Foundation. She was listed in the Princeton Encyclopedia of Poets and Poetics, the International Authors and Writers Who’s Who, (Cambridge,1977), the Contemporary Living Poets in the English Language (London) and the Marquis’ Who’s Who in the World (Philadelphia, 1998). Inamorata—the woman with whom one is in love. Ballet Philippines’ second offering for the 42nd Season: Faces of Eve, Inamorata, on September 23-25, 2011 at the CCP Main Theater, transforms the country’s grandest theater into an intimate venue of love, music, fashion and beautiful dancing. Highlighting the company’s versatility and mastery of both classical ballet and contemporary dance, Inamorata is a mixed bill performance featuring timeless classics such as The Dying Swan, the immortal solo choreographed for legendary ballerina Anna Pavlova set to the poignant music of Saint-Saens’ Le Cygne, the comedic love pas de deux from Harlequinade, and the bravura pas de deux from Flames of Paris. It also features all-new choreography by the Philippines’ brightest choreographers: Ballet Philippines’ resident choreographer Alden Lugnasin, former BP artistic director Denisa Reyes, Dwight Rodrigazo, Novy Bereber, and Hong Kong based choreographer and 2010 Gawad Buhay winner for Outstanding Choreography Carlo Pacis. Their dancers will be wearing costumes designed by top Filipino designers including Rajo Laurel, Lulu Tan Gan, Ito Curata and Jojie Lloren. Completing the mood are chamber musicians and renowned Filipino opera singers Rachelle Gerodias and Camille Lopez-Molina, who will perform the beautiful songs of the new choreographies, on evening shows. For tickets, call Ticketworld at 891-9999 or Ballet Philippines at 551-1003. The Neuchâtel International Choral Festival (NICF) is an international competition featuring numerous non-professional choral groups from different countries. The restriction “non-professional” does not apply to choir conductors. The 2012 festival will take place from Tuesday August 7th to Sunday August 12th. All participating choirs will be expected to arrive by 3 pm on Tuesday August 7th (evening meal payable by the participants). All the choirs will depart before 10 am on Sunday August 12th. The competitions, concerts and other events will take place from Wednesday August 8th to Saturday August 11th 2012. A choir may only participate in one category. In addition all the choirs will take part in a Gala Concert on the final evening of the Festival. In the morning, at the Collégiale (Collegiate church),three polyphonic Renaissance works; the obligatory piece together with two chosen works, one sacred and one profane. The duration of the two chosen Renaissance pieces must be between 3 to 5 minutes each. In the afternoon, at the Temple du Bas: one work composed after 2000 by a composer from the choir’s country of origin; one piece from the Romantic period; one imposed piece, and one chosen piece. In the afternoon, the duration of the pieces must be between 3 to 7 minutes each, not exceeding 22 minutes in all, including the NICF imposed piece (See the entry form). In addition to the competition performances, the choirs must present an evening concert open to the public. Each choir must present a seventeen to twenty minute programme, different from the competition entry, consisting of at least three traditional or folk music pieces from their country of origin (instrumental accompaniment is permitted and a piano will be at your disposal). In addition to the three events organised for the competition, your choir must also give an evening “friendly concert” in a village or town in the region. You are invited to prepare a 40-minute programme of songs from your repertoir. Works prepared for the competition may also be included. The jury is composed of three recognised international choral music personalities, with a broad experience in international competitions. • The jury may at its own discretion withhold a prize. The jury may or may not award a prize, according to the quality of the performances. After the evening concerts performed by all of the competing choirs, the public will vote by means of a special ballot form. The choir with the best average mark will be awarded the Public Prize. During the festival, the organisation committee reserves the right to organise additional choral events in Neuchâtel and the surrounding area. Participation is compulsory for all choirs in accordance with the instructions which will be communicated to them at the beginning of the Festival. The organising committee also reserves the right to record or broadcast by radio and television, in Switzerland or abroad, competition performances, concerts or other Festival events, without financial reward of any kind. • A CD recording including three musical pieces of different sorts and styles e.g. The selection committee will examine the entries received, select the choirs and notify them of their participation or non-participation in the 2012 Festival by January 31st 2012 at the latest. The entry fee is € 250 per choir, payable on acceptance of the choir at the 2012 festival. 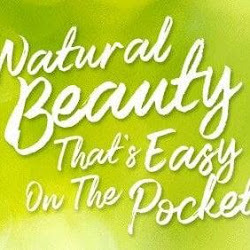 This payment must be made by February 29th 2012 at the latest, and is not refunded in the event of withdrawal from the competition. The NICF assumes the cost of meals, accommodation and transport for the duration of the Festival; that is from Tuesday August 7th at 3 pm ( (evening meal not organised by the comitee and at the charge of participants) to Sunday morning August 12th (breakfast included). For each group, these services are offered to the choir members, the conductor, one (or maximum two) accompanying musician(s), and one or two chauffeurs if the distance warrants it and if the choir travels by coach. Any accompanying person other than those mentioned above must pay the sum of € 400. This sum represents the cost of accommodation, meals and presence at the competitions and concerts for the duration of the festival. The total cost of the journey to and from Neuchâtel (meals, accommodation, transport) is payable by the participants up to their arrival on Tuesday August 7th at 3 pm and from their departure on Sunday August 12th at 10 am. The Mindanao Film Festival calls for submissions for feature-length films, short films, and documentations made by Mindanawon filmmakers or films about, related to, or shot in Mindanao. Students can also submit in the Student Short Film Category (high school and college). 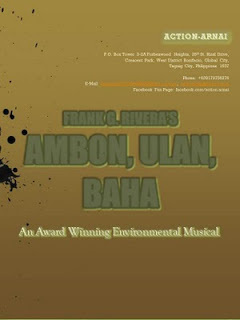 The film should have been completed from October 2010 to September 2011, and has not been screened in the previous Mindanao Film Festival. An open theme and open genre competition for 5 to 15 minute-narrative short films during the same time period. Mindanao Film & Television Foundation, Inc. Organized by Mindanao Film & Television Development Foundation, the Mindanao Film Festival is Mindanao’s most recognized and most anticipated annual filmmaking event. The Mindanao Film Festival is an initiative to promote films made by Mindanawon filmmakers and films about, related to, or shot in Mindanao to the local audiences in and around the island. The festival aims to popularize the art of independent filmmaking as an essential medium of cultural and artistic expression. The festival also aims to discover, encourage and nurture young local talents to tell the rich heritage and untold stories of the island and its people. For questions and entry forms, email mindanaofilmfestival@live.com or call +63 (82) 225-FILM. Highlights of this year’s festival include the highly regarded Guerrilla Filmmaking Workshop, Guerrilla Filmmaking Competition, the 7‐day Theatrical Screening (Competition Films, International & Local Exhibition Films), the Mindanao Film Convention, Exhibits, and the always‐festive Awards Night. THE Cultural Center of the Philippines unveils an exhibition of architectural designs entitled ICONS: Traditions and Transformation in Philippine Architecture (CCP Architectural Design Competition winners) on Thursday, September 8, 2011 at the CCP Bulwagang Juan Luna (Main Gallery) at 6:00 p.m. The event is in celebration of the CCP’s 42nd anniversary. Said exhibit is part of the CCP Architectural Design Competition held last March 2011 for the two new iconic structures: The Performing Arts Theater and the Artists’ Center. Held in two stages, the competition was open to all Filipino architects who were part of duly registered architectural firms in the country. Last April, five finalists were selected from 17 entries that included major architectural firms in the country. These were Lor Calma and Partners, Palafox Associates, Syndicated Architects, Buensalido Architects and Leandro V. Locsin Partners, Architects. The exhibit will showcase each of these finalists’ proposals, including the conceptualization and design process for iconic structures of the arts. “The finalists were chosen based on their track records, past achievements of the principal architects and the congruence of their design concept for the two buildings with our vision for the CCP Complex,” said Nestor Jardin, Project Director of the CCP Asset Development and Chairman of the CCP Architectural Design Competition. Last June 3, the Locsin design was finally selected for the two iconic buildings. According to the said group, the design for the two new buildings was conceived to evoke the idea of sculptures within a larger garden and on another level to recall the archipelagic arrangement of an island, a mangrove cluster or Badjao village, and a wave on a promontory rising out of the sea, all possible metaphors for the expression of a national architecture. The winning design of the new Artists Center by Leandro V. Locsin Partners, Architects The new Artists Center as designed would contrast the CCP Main Theater’s solid singularity. It will feature a series of lighter, transparent pavilions and is envisioned as an arts facility that will serve the mandate of the CCP to train and educate artists, arts and cultural managers, teachers and public. The winning design of the new Performing Arts Theater by Leandro V. Locsin Partners, Architects The new Performing Arts Theater will be more formal but still approachable as bicycle and pedestrian ramps and a grand entrance leading to the main lobby beckons all to step into the public space. It will have an audience capacity of 1,000 to serve the growing need for additional performing arts venue. The new Artists Center and the new Performing Arts Theater are two of the seven iconic buildings that will form the centerpiece of the CCP Complex Master Development Plan which is aimed at redeveloping the 62-hectare property of the CCP. The seven iconic buildings are CCP Artists’ Center, Performing Arts Theater, Museum of the Philippine Arts, Cultural Resource Center, CCP Film Complex, Contemporary Art Museum of the Philippines, Popular Arts Theater, which will be constructed to provide world-wide facilities and spaces for the artists and the core programs of the Cultural Center of the Philippines. The exhibit will be on view until October 9, 2011. Likewise, weekly lecture series will be conducted by architects who joined the competition and are expected to be attended by students in architecture, design and urban planning. The project team is composed of Nestor Jardin (director, CCP Architectural Design Competition/Curator), Eva Mari Salvador (Exhibit Manager), Luigi Sison (Curator) and Eric Cruz (Exhibit Design). For more information, please call the CCP Complex Development Office at 551-7248. World-renowned Filipina pianist based in Austria, Aima Labra-Makk, will be featured in a solo piano recital at the University of the Philippines College of Music Abelardo Hall Auditorium on 2 September 2011, 8pm. Ms. Labra-Makk's appearance coincides with the international conference on music in Southeast Asian societies that is being organized by the faculty of the newly-instituted doctoral program in music in the College. Awarded the highest honors in Concert Diplomate from the University of Music and Dramatic Arts in Graz, Austria University of Music in 1990, Ms. Labra-Makk leads a solid career as a solo concert pianist, chamber musician, and educator. Her performances and magnetic presence have earned her worldwide acclaim. European critics describe her playing as "marked by high musical intelligence, colorful expression with physical robustness (to sound) with elegant ease of touch but never for the sake of display." In the September 2 concert at UP College of Music, Ms. Labra-Makk will perform a repertory that is rarely heard in Manila such Jeno von Takacs Suite of Old Hungarian Dances, op.42a and Tombeau de Liszt, Bartok's Suite for Piano, op. 14, and Santos's Abot Tanaw among others. Ms Labra-Makk is the only pianist in the world who had recorded the complete solo piano works by Takacs on disc. Takacs was a one-time professor in the UP Conservatory from 1932-1933. He had done research on indigenous Philippine music, an output of which was a book on Philippine music instruments published in Vienna in 1975. Ms. Makk is an alumna of the UP College of Music. She studied under Perla Suaco. Limited tickets at 300 pesos each will be available at the gate before the show. For details, please call 9296963 (Josie) or 9260026 (Yvette).